Some years are worse than others for hollow heart. This year appears to be one of those years. 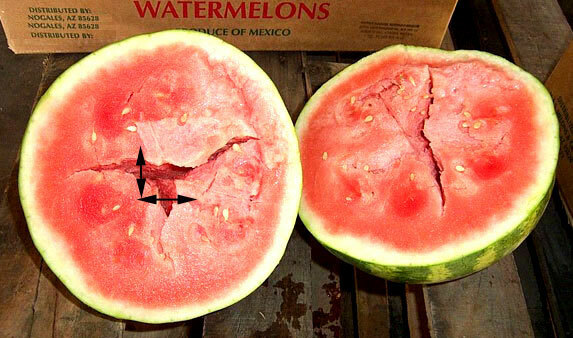 Hollow heart in watermelons is caused by a quick growth burst, usually brought on by heavy rainfall. Hollow heart is usually found in the larger melons, but it may be found in the smaller sizes as well. As you begin cutting suspicious melons, look for some external indications. The watermelon may be appear bumpy or irregular, with a prominently ridged appearance of the rind. Melons which are flat or bulging may be ones to cut. Your first cut will be a crosswise cut, about 1/2 way between the stem and blossom end. You may have may to make additional crosswise cuts or it may be necessary to make a lengthwise cut, as some hollow heart cracks travel crosswise. The scoring guidelines for hollow heart are a bit complicated. The width of the crack is measured, at its widest point. If multiple cracks are found, the width of each crack is measured at its widest point and and combined to determine the aggregate width. 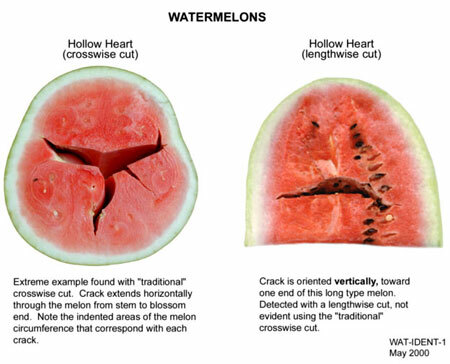 Hollow heart is a defect if the aggregate (combined widths of all cracks) width is greater than 2 inches on a round watermelon weighing 25 pounds. If the watermelon is a long variety, the aggregate width can be no larger than 1-1/4 inches on a 25 pound watermelon. 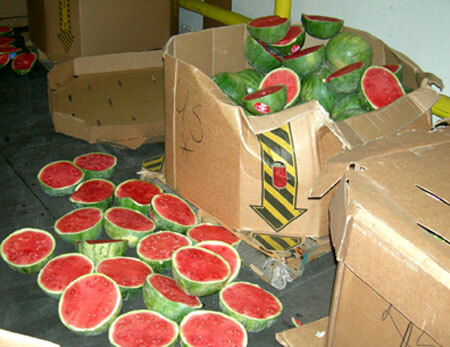 For larger watermelons you are allowed a larger crack, for smaller melons the cracks allowed are also smaller.